Baptism with water and the Holy Spirit is the mark of our acceptance into the care of Christ's church, the sign and seal of our participation in God's forgiveness, and the beginning of our new growth into full Christian faith and life. People may be baptized either as children or adults. Baptisms normally take place during the worship service. 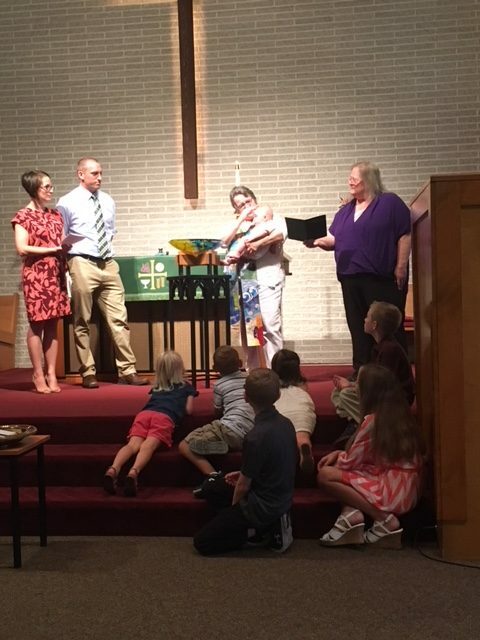 When an infant or young child is baptized, parent(s) and/or sponsor(s) promise to assume certain responsibilities for nurture and Christian upbringing of the baptized child. The congregation also promises to help the family nurture the child and to teach the child about our Christian faith. Parents: We will, with the help of God. Will you teach this child that she(he) may be led to profess Jesus Christ as Lord and Savior? Do you promise, by the grace of God, to be Christ's disciples, to follow in the way of our Savior, to resist oppression and evil, to show love and justice, and to witness to the work and word of Jesus Christ as best you are able? Parents: We do, with the help of God. Do you promise, according to the grace given you, to grow with this child in the Christian Faith, to help this child to be a faithful member of the church of Jesus Christ, by celebrating Christ's presence, by furthering Christ's mission in all the world, and by offering the nurture of the Christian church so that he (she) may affirm her/(his) baptism? In the event that the baptism is for a confirmation candidate or someone older, the individual is asked to make the promises for themselves. Baptism is the means by which a person joins the Church. Please contact the Pastor to schedule a pre-baptismal meeting and a date for the baptism. Baptisms are usually scheduled one Sunday per month.